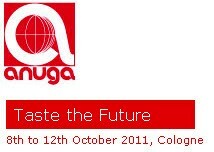 Agrocepia attended Anuga exhibition 2011 in Cologne , the worlds leading food fair for the retail and food service. More than 6,000 exhibitors were present and the number of visitors has been estimated over 155,000. For Agrocepia this fair has been a very powerful and professional business platform in order to monitor the trends of the market as well as the potential products of interest to the customers. This version of Anuga has been very succesful for the company since most of the objectives were fulfilled in relation to the type of information obtained during the meetings, market conditions about our core business and important discussions with existing and potential customers. . Our new retail line of products, based on dehydrated apple, has been shown to the customers causing great interest and suggesting new ideas in regards to presentations and variety of products. Studies show that Dehydrated Fruits are just as healthy as fresh. The benefits of an apple a day. Every year in Nrnberg exhibition center the global sector for organic food, cosmetics and eco-textiles meets to discuss new ideas, see existing and potential customers and learn together on how to protect the planet through sustainable methods. Agrocepia was there for the first time this year in order to introduce the new line of organic products that has been developed. Enthusiastic visitors were present at the booth, tasted the products and this was the fist step for a promissing future business. It was a great and succesful experience to learn about creative and innovative concepts on food safety, healthy food trends and environmental care. We hope to meet again with our customers and new visitors and clients in the next Biofach 2012!. Agrocepia USA participated the first time and with great success in that amazing ibie show 2010 in las vegas. we were one of over 700 industry suppliers that showed their products to about 20,000 attendees gathering here in the convention center. Nearly 30 percent of buyers from outside the us gave the show the typical international flair. with many thanks to all our customers as well as the new contacts that visited us on our booth we hope to see you again on one of the next events in 2011. Agrocepia again successfully participated in the 2010 edition of SIAL Paris, this time the programming of the show was affected by strikes on the transport, however the quality of the visits as well as that of our regularcustomers have made this fair a great opportunity to further develop and diversify our global market presence.